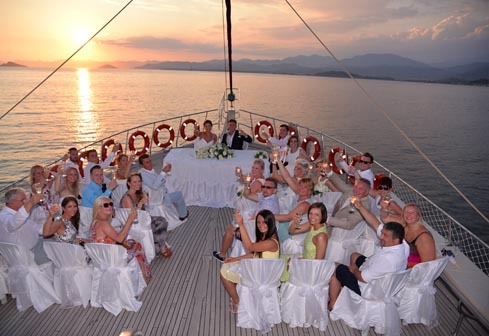 Sail to the Gulf of Fethiye with its crystal clear waters and sumptuous sunsets. Transfer to clinic and fees for medical certificate (No examination or blood test required). Fresh Floral Arrangements, bouquets/buttonholes etc – At your request we can take you to a florist in Fethiye. Costs depend on your choice of flower and arrangement. Payment is direct to the florist in either British pounds or Turkish Lira. Prices for any entertainment are available upon request. A variety can be sourced and is paid direct to the suppliers.